It’s amazing to think that it’s about a year since I last posted on this blog and 10 months since I took part in a craft fair! I have no idea why it has taken me so long to get around to correcting these things and I’m going to do both on the same day – provided I manage to finish this post in the next 45 minutes before midnight. Why am I typing this so late? In a the vain hope that I might be able to stay awake to see a new Brit taking on Novak Djokovic in the US Open Tennis. The match won’t start until 2am at the earliest. Not sure I’ll manage it but no work tomorrow so it’s worth a try!! I’ve been really busy in the last few months building up some stock, trying out some new ideas and preparing to hit the craft fair circuit again. I’ve got some new retail outlets which are both proving quite successful and I have plans to work on my Facebook page and Folksy shop to see if I can drum up improved sales online. I set up my new display at The Crafty Pint Market at The Waverley Public House in Bognor Regis today. I have recently purchased a 3 shelf collapsible bookcase – a great little item for a modest price, easy to transport and I thought it would be ideal to give some height and make my table more attractive. Looking round the room today I see that many of my co-crafters had exactly the same shelving that I had selected – great minds and all that! Ted’s modelling prowess brought some nice comments from the Bognorians – he sat patiently all day without complaint but failed in his ultimate goal – I still have the hat! 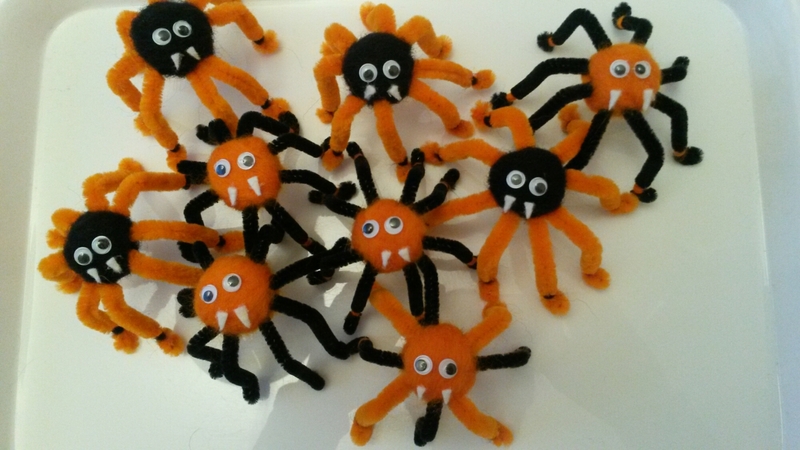 Spiders were a hit with the youngsters and my next fair at Worthing Pavilion on 9 October will see more of them escape from my bag – Halloween is coming and they can’t wait to take part in the fun (see last blog post below). I was surprised that felted soap did not attract more comments. Perhaps these unusual and inexpensive presents will be more appealing nearer to Christmas? Thinking about the impending festive season, I spent the day making some hanging Christmas pudding tree decorations so, not only did I have a very pleasant day with fellow crafters, I sold some of my wares and was productive as well! All in all a good day and, despite spending the day in a pub, not a drop passed my lips until the red wine I had with dinner this evening!! Dear Blog readers, I must confess…I told you a lie in my last post back in May! My thoughts and intentions were completely true and correct at the time but the bug I’d thought I’d been bitten by turned out to be nothing more than a surface scratch which cleared up really quickly! Dark evenings are now with us of course which is never a great incentive to get out after work and also produces those SAD feelings which some of us are prone to. However, I just think I’m being a bit lazy really and there is no use moaning about putting on a few pounds if I can’t be bothered to do anything about it…I only have myself to blame. Today I took part in my 7th Bognor Regis 10k run! It’s my absolute favourite of all the many runs I’ve ever done. Why is that? Well, I used to live in Bognor so that made it special; its a great course and there is support almost every weary step of the way from the enthusiastic crowds who turn out every year, no matter what the weather, and it’s the first run I ever watched, many years ago with some friends. Nothing special in that really except that whilst standing cheering on the runners I thought to myself ‘I wish I could do that’ although I honestly believed that I never would. I think that may have been in 2000 and now I can’t believe that, not only have I run the race, but I’ve done it 7 times! I’m not in any way athletic – I was last to be chosen for the team in PE lessons on many occasions! I’m not a great runner either – getting slower as the years go on and I approach a milestone birthday! But, with running comes an activity that no doubt helps keep you fit and healthy but costs little to take part in and gets you out in the fresh air. A good pair of running shoes and you’re off! I’m not about to tell you it’s easy – I’m often reminded that the first time I attempted to run ’round the block’ my partner thought I was going to keel over!! With regular practice however, starting slowly and building up distance (if not any great speed! ), running will release all those wonderful endorphins in your brain that make you feel good (although outwardly you may look like a hot, sweaty, mess!). I really do envy those ladies who can run a 10k and look as perfect at the end as when they started!! I’m pleased to say training went okay, glucosamine tablets are either a great placebo or are doing wonders for my hip joints and the bug has bitten again – now it’s onwards and upwards to the 10k Coastal Run in Littlehampton on 7 September! The Blues And Some Pure Pop! I will apologise in advance for this post as I’m afraid it may be less than positive. The main reason for this is I am 49 tomorrow and whilst this is not an issue in itself, this is my first birthday without my Mum. People told me this would be a difficult year, the first time for everything without sharing it with her or telling her about it. I got through Christmas surprisingly okay but this feels more significant somehow. I now think it would have been good to have a brother or sister to share these feelings with (not a thought I’ve had very often I confess), instead I bend the ears of my nearest and dearest and my understanding friends, all of whom have been brilliant and seen me through the low points so far – trouble is I am well aware that once tomorrow has gone there will still be other firsts and low points to come in the months ahead. On a happier note, I have been busily crafting away recently and did my first fair of the year yesterday at Broadwater Parish Rooms. I do find that escaping into a world of colour and creativity is a buzz that helps keep me sane at times. There were a lovely selection of crafts and vintage for sale and a really happy vibe to the place thanks to the super organisation of Suzanne Bramble. 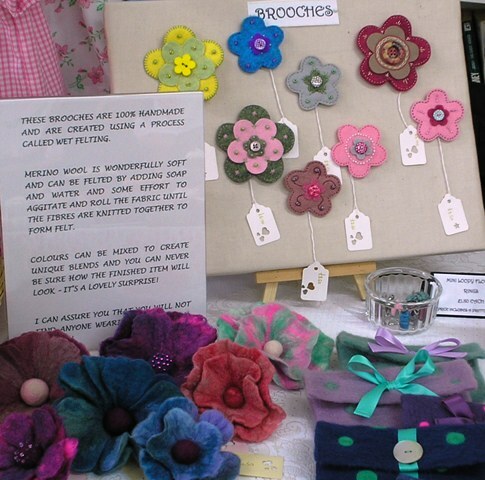 My hand felted brooches and purses drew some interest, discussion and sales; some of my cards disappeared too so you just never know what could come of that! I only had a small table but the display went well and there are some photos below of my set up. No other fairs booked at the moment so I must get to grips with updating my Folksy shop and changing my stock at Crafters’ Corner. I’ve surprised myself, this post is not as down beat as I thought it would be and I feel in a better frame of mind now I’ve written it! I’ve had a big chunk of well deserved ‘me time’ today. 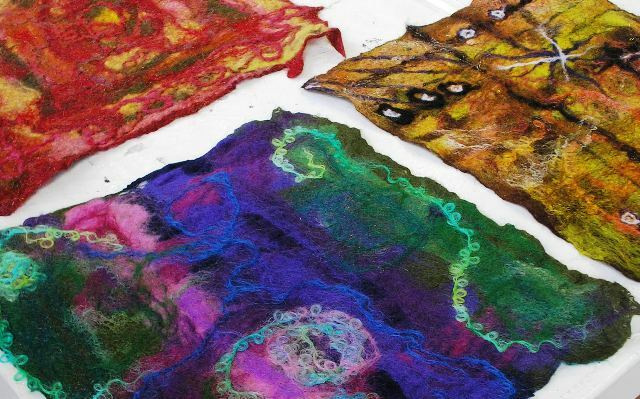 Thanks to an email from the tutor whose felt workshops I attended last year at the wonderful Sussex Prairie Garden, I have spent the day wet and dry felting at Evolution Arts in Brighton (www.evolutionarts.org.uk). Mo Jackson is an inspiring tutor who genuinely loves what she does and this rubs off on those she teaches. 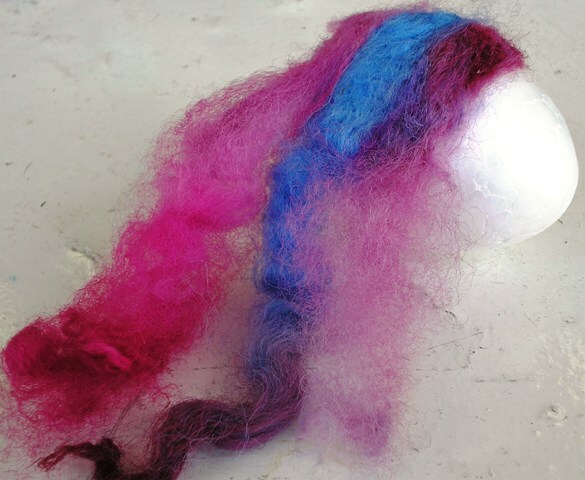 We began with making a piece of felt by the wet method (fluff and soap suds again) and I chose pinks, purples and white. 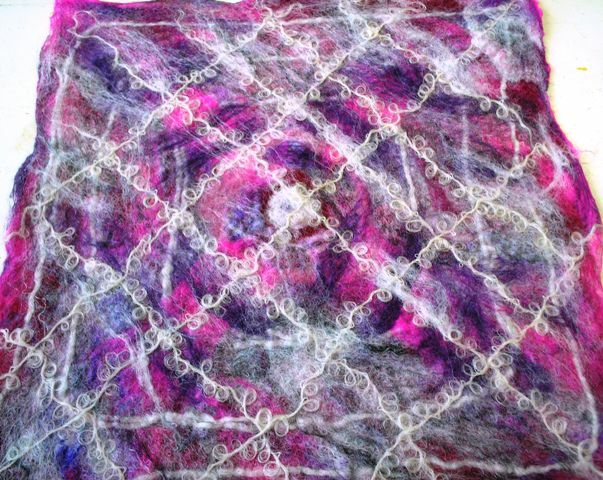 My ideas began to change as I laid out the wool and, as with my previous nuno felting, I ended up with some straight lines and pattern to my finished article. I think it will make a good wall hanging or I might frame it. It measures about 10″ x 10″ so would make an impact on a plain wall. It’s amazing to see what others create from the same raw materials and my fellow felters all produced lovely finished products but all so different. Here’s a photo of a few of them. After lunch we were offered a choice of what we wanted to make; flower brooches, a bowl, needle felted balls or small animals. I chose to needle felt on to a polystyrene egg shape and, if I’m honest, I wasn’t best pleased with the result and wished I’d made a flower instead! But at least I’ve tried this now and know I can do better. 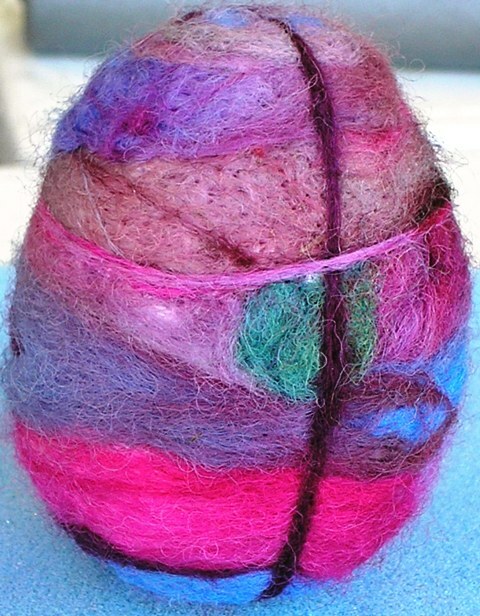 Photos below show the egg shape with some wool attached and the finished fully felted shape. I was definitely in a pink and purple mood today! One of the very helpful tips that I picked up from Mo today was that I could do my needle felting much quicker if I used a coarser wool so I will be shopping around for some of this online later. I finished off the afternoon making some small needle felted balls to turn into a necklace in a mixture of greens and yellows although after someone said they looked like sprouts, I’ve been put off the idea of wearing them!! I ended my trip with a cappuccino and a toasted teacake in Costa – perfect end to a lovely day!